The wood blocks are located at each end of the panel. 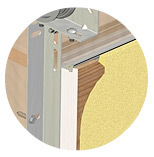 The hinges and rollers are attached to wood end blocks with heavy duty lag screws adding stability and life to heavily used doors. Also, as in high end entry doors, it is the most effective thermal break of all.